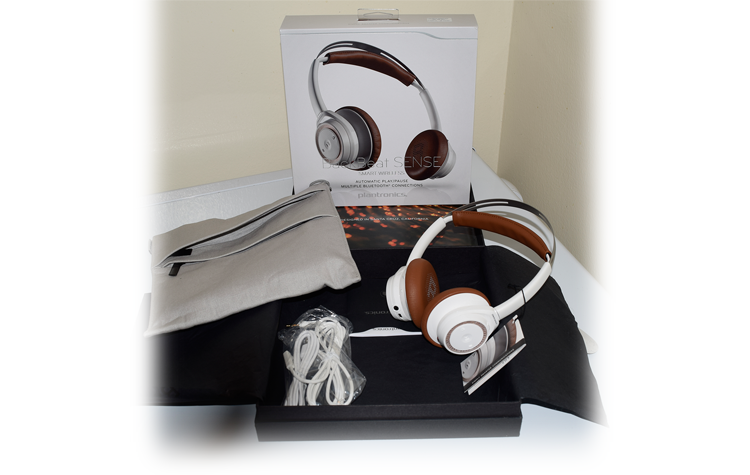 Plantronics are releasing on July 22nd their new set of headphone addition called BackBeat Sense and they wanted to see what Android Coliseum thought about them. During the live telephone conversation I had with Lars at Plantronics, I got to learn some of the core value that they bring to the consumer market. Being that Plantronics has been 55 years in business they understand the importance of what it is to find the core of what the consumer market is when looking for a pair of headphones. BackBeat Sense is at the forefront of providing a sense of style, a sense of music you haven't seen in a lot of products. The feel, the comfort and a lot of time was put into these to make them a versatile piece that anyone can enjoy. Not only can the headphone expands to accommodate anyone, the cushy leather extensible feels nice to rest on your head on versus the metal band. The left earpiece allows you to adjust the volume just with a swivel forward or back. On the left side you can also use the forward, back and play/pause for your music. A neat feature that was built into this headset is the auto play/pause when you put on or remove the headset, allowing you to pick up wherever it was left. Plantronics made sure to blow my socks off with the features. There's a mode on the BackBeat Sense that allows you to, in one single press, turn the volume down and allow ambient noise to be heard. This allows you to put the music in the background and respond to someone that might want to say something to you without having to remove the headset from your head. The smart wireless headset has some tricks up its sleeves, not only can you pair up to 2 devices, it will be able to identify which device is currently in use. Signature Plantronics audio and dynamic drivers create the optimal balance of rich bass, crisp highs, and natural midtones to let you enjoy your music to the fullest, and hear every detail in your media. Dual mics enable HD Voice communication for clear calls or interactions with voice applications such as Siri™, Google Now, Cortana and Skype. OpenMic™ technology for those times when you’ll occasionally need to hear the outside world. With OpenMic, you can do so with the touch of a button, and without missing a beat. Fold-flat earcups makes BackBeat SENSE easy to transport and store, and a durable pouch is included with a handy pocket for charging and audio cables. Advanced Class 1 Bluetooth lets you control up to two connected smartphones or tablets from up to 330ft/100m2 away—the length of a football field. It wouldn't be complete without the ability to use this headset with it's additional 3.5mm stereo jack with 3 button control for use on any other devices. With up to 18 hours worth of continuous music playback and or phone use, this makes the BackBeat Sense a nice little gem. The price point for the Plantronics BackBeat Sense is going to be marked at $179,99 USD.